Red Velvet Cake smells more like cake than tea, there’s no doubt about it. In a way, it reminds me of Birthday Cake, but there’s a chocolate fragrance to this tea that Birthday Cake lacks. The aroma of vanilla and chocolate wafts up from the bag when I open it, and it’s just delightful. Red Velvet Cake is a black tea blend that consists of: black tea, chocolate, white chocolate, sprinkles, beetroot powder, natural and artificial flavouring. It also contains milk and soy in the ingredients, so those that cannot have lactose beware! It smells and looks amazing. If it had more red and white to the tea, I could see this being marketed as a Canadian tea (since, after all, DavidsTea is Canadian). 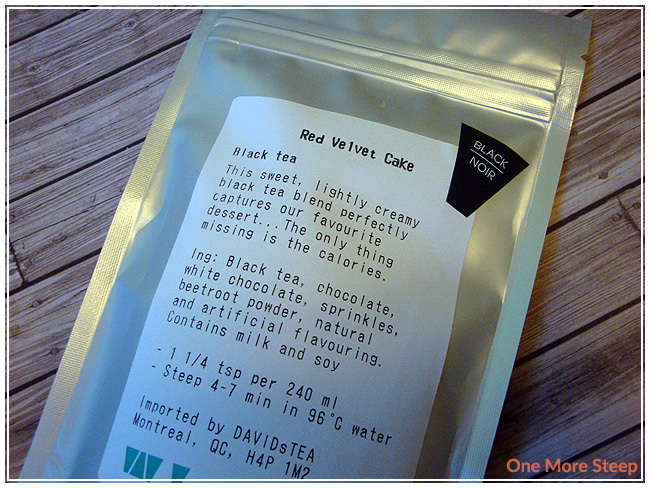 DavidsTea recommends steeping Red Velvet Cake in 96°C (204°F) water for 4-7 minutes. I steeped my cup of Red Velvet Cake for the full 7 minutes to give the sprinkles and chocolate the time to melt and dissolve. 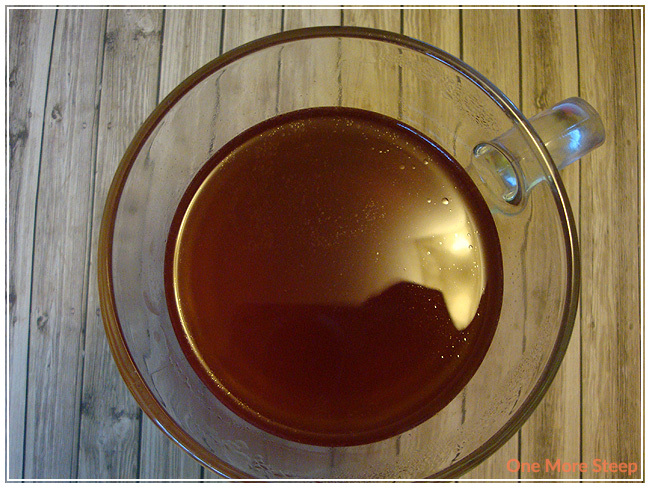 Red Velvet Cake is not a clear tea, it’s a bit of a murky reddish brown colour and it has an oily film on top that I was expecting (this is from the oils in the chocolate and the sprinkles). It smells amazing though, just like the dry tea smelled. Chocolate and vanilla, what’s not to love? On first taste, I’m greeted with the oily mouth feel that the oils from the sprinkles and chocolate gives the tea. It’s not unpleasant and does coat my mouth a bit. The flavour of the tea itself isn’t to exciting. It is surprisingly not as sweet as I expected it to be (since there’s so many sugar-laden ingredients). I added some sugar to the tea and that helped brightened up the overall flavour of the vanilla although I still struggle to find the chocolate in the flavour. 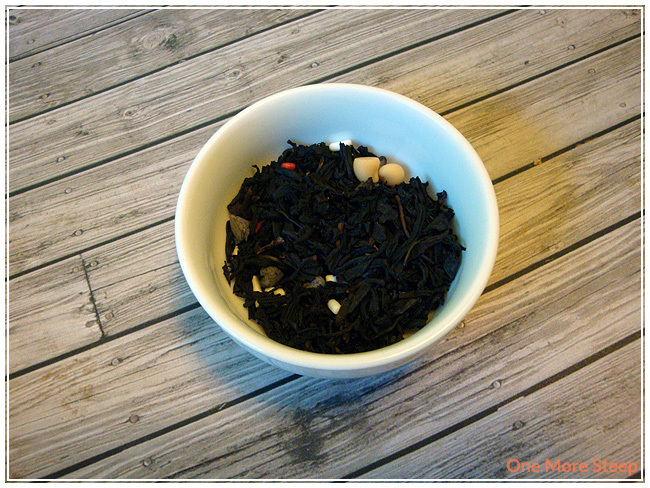 The black tea base is also hard to find in each sip. The tea itself is okay in terms of flavour, although I do wish the chocolate came out a bit more (along with the tea base). If you set aside the cup and walk away and come back, the tea does not redeem itself when it is cold. I resteeped the leaves from my first cup – it will be a surprise to nobody that it didn’t turn out very well for a second cup. I would say that Red Velvet Cake is a one cup wonder. I thought that DavidsTea’s Red Velvet Cake was just okay. This reminds me a lot of Birthday Cake, which is both a good thing and a bad thing. The chocolate was a struggle to find, and the tea itself was a bit of a let down in terms of matching up between the dry leaf and the steeped tea. It smells amazing though, and when it is hot the tea is quite palatable. It has a nice, rich vanilla flavour to the tea, but I think steeping it according to the directions was where I went wrong. I will try this again with more of the tea (perhaps in a pot?) and steep it for longer periods of time in hopes of coaxing out more of that sugar and chocolate from the sprinkles and chocolate chips. Given the ingredients, I would say this would likely taste really good steeped in milk as well or at least having some cream added to it to give it that bit of oomph that it needs to have a heightened richness in flavour, but it’s not doing much for me having steeped it in water.